Designed to keep a sharp edge on both single and double edged knives. Constructed from impact resistant ABS with a classic black finish. The sharpening wheels are super hardened alloyed metal and ceramic constructed for fine and coarse sharpening. 8 1/8" long, 2" wide. I think this thing is great for my kitchen knifes. I ran a couple of pocket knifes threw this thing, and it worked good. I then tried a small 14" machete. I would not recommend that. This sharpener seems to be really meant for small knifes. I only tried my small machete to see haw far the sharpener can go. It gets a five star for small knifes, but a zero foe anything bigger then twelve inches. Really wish it came with a manual, but that's no reason to trash an otherwise good product. Really good for the price mentioned and it did sharpen this really dull knife I had. All in all very satisfied. doesnt work well with short blades you cant sharpen the fisrt 1 inch. not bad for kitchen knives or machettes. just buy a wet stone. I just got it a few minutes ago and I can already tell that it's going to work wonders! I used the coarse side a few times now and my Bowie knife is starting to pick up an edge. A few small problems however: I can't fit an inch of the blade ( the part by the cross guard) rendering that portion untouched. Also, the fine sharpener is something of a mystery to me (First sharpener I've ever used) I don't know how to use it properly and I'm afraid I might damage it or my knife if I try experimenting. Could use a manual or some online help. 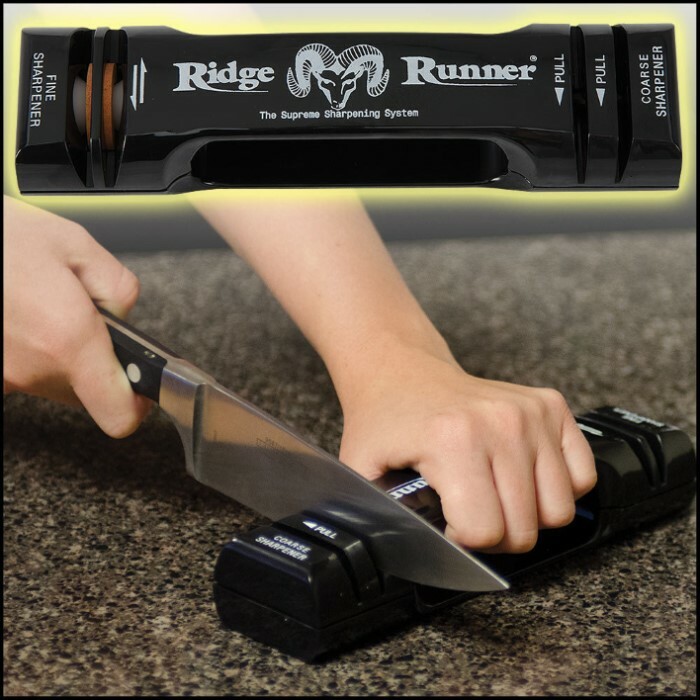 It's a great sharpener for pocket and throwing knives. if you have alot of either one, i would suggest this sharpener. 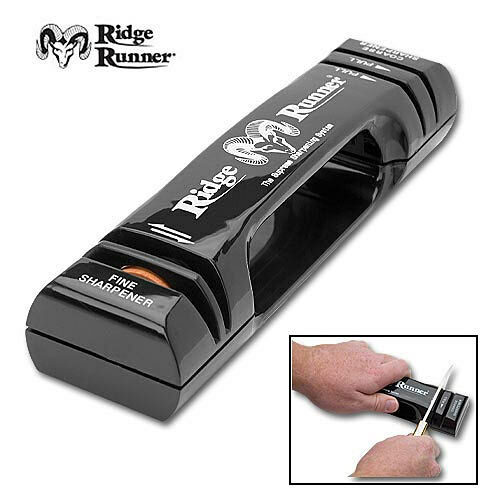 great sharpener over all but remember youre paying only 13 dollars for this. i wouldnt put expensive steel on this but for your average joe blade its great.